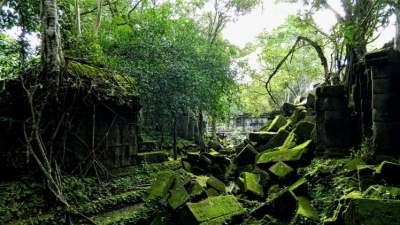 Ensemble de Beng Mealea is part of the Tentative list of Cambodia in order to qualify for inclusion in the World Heritage List. Beng Mealea is about 75km away from the main group of the Angkor temples, therefore it is quite isolated from the rest of the archaeological area. It’s mostly surrounded by thick forest and it’s mostly collapsed. What is really interesting about this temple is the mystery that surround it. It is known that it was built during the Angkor Wat period, because of the architectural style, but its history is unknown. And yet, it is one of the largest Khmer temples. Moreover, being so isolated, not that many visitors reach this temple and private transportation has to be arranged. In my opinion, the hassle and the higher cost to get to Beng Mealea was totally worth it. That day I really felt like those explorers who found this temple after it had been forgotten for centuries in the jungle. This ensemble is a clear example of a jungle temple in Cambodia. Many trees grew on the temple ruins however beautiful apsara carvings and statues are still visible. It really should be included with the Angkor Wat listing but the fact it isn't yet probably means less tourists visit and therefore is a perfect temple to explore in peace and quiet.